As Derby’s ordeal progressed in June, I began looking around for a horse to ride. I needed to keep the rust from forming on the dressage muscles. Good fortune smiled upon me, as a woman Christy had been in contact with was looking for a share boarder for her horse, a handsome Andalusian. 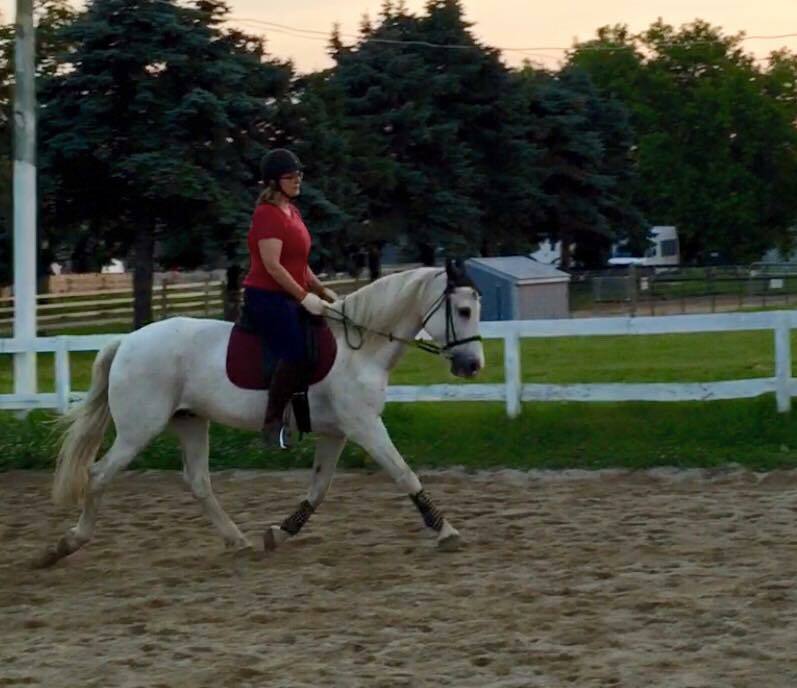 Pregnant with her second child, she was still able to ride, but dismounting was becoming a real challenge! Christy and I went out to meet Elizabeth and her lovely steed Justin and see if we all clicked. The polar opposite of my long-backed, long-necked, downhill Derby, Justin is compact and naturally inclined to use his back end. He is also very forward, but rideable and thoroughly pleasant. At first, I floundered a bit on him, but Christy stepped in and with some coaching, Justin and I started to click. I wrote Elizabeth a check and have been shareboarding him for the last few weeks. He’s about 15 minutes away from where I kept Derby, so I’m doing my lessons on him, and getting an extra ride or two in as well. Riding Justin is like saddling a Ferrari. In addition to being forward and enthusiastic, Justin is also extremely maneuverable. When I tighten a leg and think “Let’s do a shallow serpentine,” what I get is a 5 meter half circle. 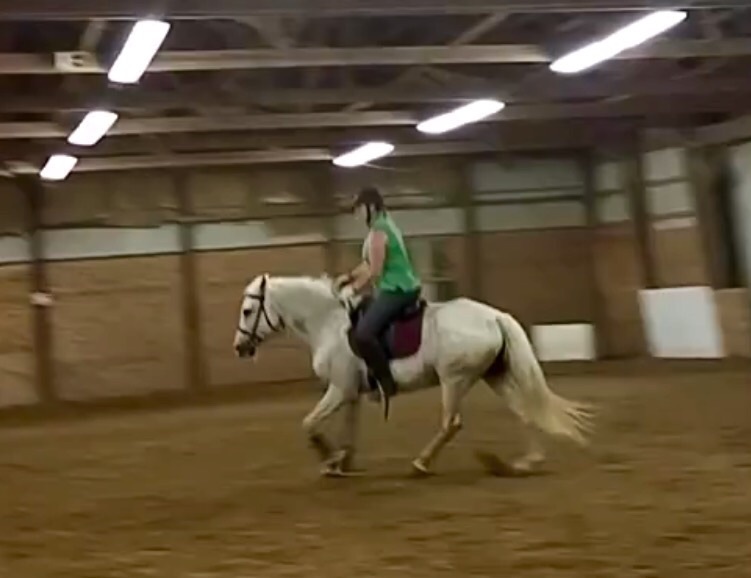 He’s got more education than the other horses I’ve ridden, and is proving to be a great teacher for me, providing a crash course in some totally new subject matter, especially important in the context of the search for my next horse. With his white coat, flowing mane and dark, limpid eye, Justin is a perfect little unicorn – he’s just missing his horn. He’s proving to be a great distraction from my current travails, and a good little buddy in the making. One door closes–often with a loud and unwelcomed “bang”–but another door opens. Am so glad to read you have a new partner and one that sounds like a very willing and kind teacher. Do you think that part of the trouble getting Derby to work over his back consistently could have been his neck issues undiagnosed? That would explain a lot.